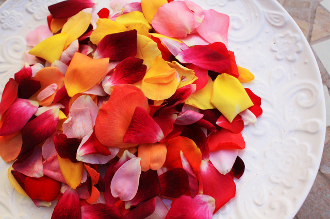 Beautiful array of rose petals; Pink, red, yellow, orange, lavender, white, purple and more. Color mixes may vary per Season. Mild, sweet taste with a wonderful springtime fragrance. Incredible garnish for salads, platters, tables, cocktails and desserts. Simply sprinkle these lovely thin petals anywhere to make everything more colorful! Sizes range from 1"-2" in length.